Aspiring nurses who are considering opting for an online nursing degree instead of an on-campus option might be wondering exactly how long this program would take. The good news is that, in many cases, it’s actually possible to progress through the online program at a faster rate than would be possible in a more traditional degree program. There are several reasons for this, including accelerated terms and more classes offered throughout the year. Overall, however, the duration of a nursing program taken online will depend largely on how much time students have for coursework, how many courses they wish to take in a year, and how much educational experience they have at the time of enrollment. For students who have already completed a two-year nursing degree at a community college, and therefore are able to work as Registered Nurses already, a “completion” program can be taken online in an accelerated, RN-to-BSN format. This program is designed to build on the skills learned during two prior years of study, and acts as a supplement that teaches slightly more advanced pathology and care procedures. The RN-to-BSN completion program typically takes no more than two years, though many students take three full-time semesters per year and finish the bachelor’s degree in as little as 18 months. While completion programs are great for nurses that have already spent two years of their time working through community college coursework, they’re often not the most popular option among aspiring nurses as a whole. Instead, many nurses start out in a four-year program that awards a Bachelor of Science in Nursing degree. These programs on-campus would take no fewer than four years from start to finish, and that’s if nurses succeed in all of their classes, don’t change their major at any point, and attend full-time for all four years. Online, this can be significantly shortened. 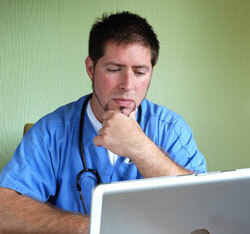 Most online BSN programs allow nursing students to take classes in a trimester format, in the spring, summer, and fall. Additionally, many programs allow students to take up to 18 credits per semester in an accelerated, 7-week term format that fits two terms in each trimester. By following this accelerated format, students can complete the full BSN program in as little as three years. That will put them a full year ahead of their friends in offline nursing programs, and give them a significant advantage in the job market as they begin looking for entry-level employment. An online nursing program must still adhere to state requirements for the nursing curriculum, clinical experience hours during the bachelor’s degree program, and preparation for the NCLEX licensing examination required of all nurses. This means that, even with a trimester schedule and an 18-credit maximum per term, nurses will still have to fit in between 5 and 20 hours of clinical experience during each semester. This is an important consideration when choosing an online option and scheduling classes for each term. The great thing about an online nursing program is that it offers students greater flexibility and convenience, giving them faster completion of the degree and more options for clinical experience and NCLEX preparation. As students prepare to work on an online nursing degree, however, it’s important to remember that even an online option will require clinical experience, NCLEX testing, and intensive core classes, which can be a full-time job all on their own.